At the end of last year the Institute for Public Policy Research published its ‘Future Proof report’. It painted a bleak picture for British citizens by 2030. It suggested that, unless solutions were sought, an ageing population would place a huge and unsustainable burden on the public coffers. The growing national debt and pension liabilities either to public sector pension schemes and the state pension were cited as reasons to seek solutions to the so called ‘demographic burden’ of an ageing baby boomer population. The report suggested that these liabilities would be a considerable financial burden which future generations would have to pay off through their taxes. In 2014, the Institute of Economic affairs also added its warning by claiming that future generations could be ‘short-changed’ and the public finances put in jeopardy unless the UK takes serious measures to reform the state pension system. Clearly there is no shortage of organisations and politicians ready to pitch in to reinforce this message. To that end, Sir John Cridland, former CBI Director General, is due to publish an interim report early this year aimed at ‘ensuring the state pension remains affordable’. In response to these fears, changes to the pension retirement age are already in progress and, whilst it is currently set at 66, it has been suggested that the Department of Work and Pensions may have plans to increase it further to the age of 70. Furthermore, the Chancellor Philip Hammond has hinted that after 2020 state pensions may no longer be ring-fenced from spending cuts. Added to these messages of unaffordability there is also something far more insidious going on. In Australia, a crossbench senator recently said that ‘taking the pension shouldn’t be something you aspire to, it should be something you try to avoid because it signifies you’re in a low-income group’. He suggested that payments be viewed as welfare not an entitlement. Right wing ideologies which promote the primacy of the individual over that of the well-being of a wider community have led to an emphasis on individual responsibility which has, in turn, led to the shaming of those who find themselves on the wrong end of the economic stick. The inference is that if you’re poor, unemployed or sick then you only have yourself to blame. The political discourse is making it clear now that pensioners are not only about to be added to this list but also perhaps even condemned for not having saved sufficiently to pay for a decent retirement. Even the prospect of retiring is no longer sacrosanct. The Tory peer, Baroness Altmann, tweeted last year that “private pension/health will drive retirement age” thus suggesting that unless you’ve got a big fat private pension or health insurance you can forget retiring on a state pension because it simply will not pay enough to cover your costs. Clearly retirement is intended to become the privilege of the rich and well heeled. Citizens face the prospect not only of a two-tier health and social care service but also a two-tier pension entitlement – one for those who can afford to save for one and one for those who can’t which may condemn people to working beyond retirement just to survive. “We can trace the untimely demise of retirement to a number of assumptions about how society ought to be organised. At no other time since its inception has the welfare state been so hated by the governing elite. Social care. Unemployment assistance. Health. Local councils and libraries. Municipal parks. Anything relating to what used to be called “the public good” is attacked at the roots. Austerity redefines these things as fiscal liabilities or deficits rather than shared investments in common decency. It was only a matter of time before pensions too were put on the chopping block”. Of course, it might also be said that things are not looking favourable either for those who are paying into private pensions. Not only have many defined benefit pension schemes been closed and replaced with pensions linked to the uncertainties of the stock and bond market but also in a new development the government has recently announced a consultation paper which could take thousands of pounds of income away from 11 million retirees. This means basing annual increases on the consumer price index rather than the retail price index. The paper also suggests that where a company is facing significant financial pressures it could suspend increases altogether. In the heady days of market superiority private pensions might have been all the rage but in these cash strapped times and market uncertainty the gloss may be rubbing off. Whilst clearly the mainstream and ideologically inspired experts view this demographic transition as a ticking time bomb of the financial kind, I want to investigate in this article how this view has arisen and show that, because we misunderstand how our money system actually works, the argument is far from an affordability issue. Since the post war settlement which led to the creation of social welfare provision including a state pension and free healthcare and education citizens have been bound together by a social contract based on mutual support across the generations. That social contract is now under threat. Young people quite rightly compare their impoverished lives with those of their post war parents and grandparents. Lack of adequate, affordable housing, debt ridden higher education, poorer employment opportunities, low pay and lack of job security not to mention the prospect of working longer and a poverty stricken old age are all a cause for anxiety among young people who fear for their future prosperity. Quite predictably it stirs up resentment as they perceive the older generation having very nice, comfortable lives thank you with their own homes and decent pensions! These are advantages that the young can scarcely dream of unless they are lucky enough to have a helping financial hand from parents or grandparents. The inference is that the social contract is no longer sustainable because in the future there will not be enough young people generating tax receipts and income to fund all those things which we have come to rely on to make society decent and civilised. At the Conservative Conference last October the current Chancellor, Philip Hammond, warned of the dangers of piling up debt for our children and grandchildren promising he would restore fiscal discipline and get Britain back to living within its means. Georgia Gould, a Labour Councillor in North London, has even suggested that we may have to reconsider the principle of universal pension benefits in the light of the supposed financial ‘black hole’ they represent. What should be the right ‘balance’ of public spending between the generations to ensure a fair distribution of wealth and resources is the mainstream question and is there even a future for state paid pensions? The message that our pensions along with our social security system is too costly and unsustainable is constantly drummed into the public consciousness. Austerity, cutting public spending and privatisation have been presented by all the main parties (until recently) as necessary to get our public finances ‘under control’. And yet, despite the growing evidence that cutting government expenditure on public and social infrastructure has had catastrophic consequences for the nation’s overall economic well-being – fiscal discipline and paying down debt is the re-occurring mantra of mainstream economists and politicians (even if the timescale for such plans has slipped somewhat in the face of an uncertain economy). We need urgently to challenge these claims. It might first be worthwhile spending some time on explaining from where this narrative arose. The Keynsian inspired post war consensus started to break down in the 1970s with the two oil shocks and resultant rising inflation and unemployment. This also coincided with the infiltration of neoliberal/monetarist ideas into the political mindset which was to have increasingly destructive consequences on economic policy for the next 40 years. This decade saw the death knell for post war Keynsian policies and initiated a shift away from full employment. Labour eventually paid a high price for its management of the economic crisis and lost the election to the Tories in 1979. Margaret Thatcher brought to the table an economic vision inspired by Friedrich Hayek and Milton Friedman and her policies reflected her belief in the superiority of the market, less government involvement and the importance of the individual. The idea implicit in this dogma was that the welfare state deprived people of the opportunity to make their own arrangements for pensions, health and housing. As a result, the merits of home ownership were promoted and our stock of social housing sold off, along with the opening up of the market for private pensions in an attempt to weaken the state’s own pension provision, both of which continue today. Treasury documents released last year revealed that Thatcher also supported a plan to dismantle the welfare state and introduce private health insurance to end the NHS. By the time Labour finally returned to power, market driven ideology was firmly entrenched in the political narrative. Under Tony Blair’s leadership the party, with its ‘third way’ credentials, rejected its socialist roots and fostered a laissez-faire capitalism of globalised markets and increasing corporate power. Philip Bobbitt in his book ‘The Shield of Achilles’ published in 2002 suggested that power of the nation state would, over time, lose its authority to the ‘market state’. The ‘nation state’ he said ‘derives its power through its promise to improve its citizen’s material wellbeing, while the market state is legitimised through its promise to maximise its citizens’ opportunities.’ To put it simply the centralised state has indeed been replaced by a market state orthodoxy which is fragmented and outsourced. In short, public money is being poured into the coffers of global companies to run public services for profit. It is a place where, it would seem, the term ‘public purpose’ has its narrowest meaning. Following the Global Financial Crash when Labour with some success flirted for a short period with Keynes, the Tories returned to power in 2010 to reinforce the corporate dominated, revolving door politics of the past decades. And, on the basis of an incorrect accusation of Labour’s overspending, began their attack on public services, the NHS and social security peddling the cruel mantra of ‘we must live within our means’ in justification. However, the increased poverty, inequality and insecurity can be attributed not to previous governments overspending or living beyond their financial means but rather a pernicious ideology which has put increasing the wealth of the few above the well-being of society and raised the status of the corporations to gods. Politicians aided by a self-interested press, corporations and the wealthy have convinced the public that the state finances are like their own household budgets and that the national debt and deficit are dirty words. We have to cut expenditure to get our public finances in order to prevent burdening future generations with debt and higher taxes is an oft repeated message in the media. So, is it true that by borrowing now we are burdening future generations? The short answer is NO and is indeed illogical. We should be challenging such a distortion and indeed presenting the real facts about how our money system works in practice. The economist, Professor Bill Mitchell rightly points out that past and current policy decisions do affect young people today and will also affect future, yet to be born, generations. However, as we have seen this has been presented by politicians and think tanks in terms of financial affordability – whether there is enough money in the public pot to continue paying for social security, the NHS, public services and education both now and in the future. Deficits and public debt have become society’s bogeyman which has proved a very useful myth to justify continued public sector cuts and privatisation thus serving the pursuit of a political ideology rather than any sort of economic reality. We are regaled endlessly with the message that fiscal discipline is vital if we are to maintain a healthy ‘bank’ balance, save for a rainy day or avoid bankruptcy. Of course, that would be true if the State’s finances ran like our own household budgets where our expenditure is limited by our income. However, this may come as a shock to some but in a post gold standard world government spending is not constrained by the taxes we pay. “Borrowing” doesn’t take any money at all from the pockets of future taxpayers and baby boomers (like myself) have never been asked to pay back a single penny of the public ‘debt’ accumulated by their parents’ generation. Indeed, those fiscal deficits created public assets and infrastructure from which we have all benefited. Those terms debt and borrowing are loaded words which fit very nicely with our understanding of how our personal finances operate in practice in a Wilkins Micawber sort of way. However, in terms of a sovereign state issuing its own currency it bears no relationship to our own household budgets. The funds that pay for bonds or what is called ‘borrowing’ began life in government spending. So, when economic experts and politicians refer to debt clocks claiming that we are sinking under its weight and we cannot afford to burden future generations we need to take a step back and look at it rationally. If the government is the currency issuer then as Professor Mitchell points out, it is in fact, only ‘borrowing’ its own spending back. So how on earth can we be said to be ‘borrowing’ from the future? As Paul Segal, a senior lecturer in economics noted, the debt is ‘the money the government owes us, not money that we owe to anyone else. […..] What is called the ‘national debt’ is our own savings, looked at the from other side of the balance sheet”. And how does it get there? We put our savings into banks and pension funds which are then invested by those same banks and pension funds when they buy interest bearing government bonds, which include premium bonds by the way,from which investors and retirees then enjoy a return as income which is either saved or spent into the economy. In short, if you’re worried about the national debt then you should do the decent thing and stop enjoying the proceeds of your investment savings. Furthermore, and fundamentally, as Bill Mitchell highlights ‘Every generation chooses its own tax rates. That is, the mix of public and private sector involvement in the economy is a political choice’ The key word here is choice. Governments make policy choices related to the particular politico/economic ideology they espouse and for the last forty years and more that choice across the political spectrum has been neoliberal and market driven. The result has been more about redistribution of wealth upwards than ‘trickle down’ and this has been at the expense of ordinary working people. As the economist, Ellis Winningham recently noted: ‘The rich have been robbing us’. Oxfam reported in January that runaway inequality has created a world where 62 people own as much as the poorest half of the world’s population. The idea that government policy should serve public purpose aims as it did during the post war years for the economic well-being of a nation has largely been abandoned in favourof the rise of a deregulated corporate driven state whose hallmark has been excessive greed. When those on opposition benches take the government of the day to task for rising debt and increasing deficits as if these were signs of poor economic management, the public are quite understandably horrified at government’s apparent wastefulness – how that suits the orthodox agenda! The debt and deficit are, however, largely misunderstood by the public, and politicians either take advantage of that confusion to be better able to justify ideological austerity, cuts and privatisation or simply don’t understand that their own knowledge is flawed. In short, deficits (i.e. the difference between what is received in taxation and actual government spending) are neither good nor bad in themselves – they are more of an economic indicator of whether a government is doing its job effectively or not. Thus, the success or failure of an economy will depend on whether there is an appropriate level of government spending to ensure full and productive employment. Historically, fiscal deficits have in fact been an enduring feature of post war economies and are, in the words of the economist Dr Steven Hail, ‘normal and necessary’. …It is not the government’s role to run deficits or surpluses. We want governments to make policy choices that will maximise the potential of the people to enjoy their lives and contribute the best they can, given their own circumstances to the well-being of society and the planet. We might call this goal one of public purpose. An essential element of that goal, given current cultural mores in most nations, will be to ensure that everyone who wants to work has a job and for those that are unable to work, for whatever reason, have adequate income support so they are not alienated and socially-excluded. When Labour came to power after the second world war the aim of Clement Atlee’s government was to create a more stable, fair and less exploitative society than had been the case before the war. Fiscal deficits were an enabling factor in achieving this. Our parents and grandparents didn’t whisper in corners about government wasting money or talk about how governments should be fiscally sound they understood its role in making their lives better. We have all benefited from that wisdom and foresight even if we have increasingly forgotten that, over the last few decades, as market and monetarist orthodoxy has replaced a public purpose vision which benefited citizens through access to publicly paid for health and education, decent housing, public services, social security (including pensions), redistribution of wealth and a focus on full employment. We neither went bankrupt then creating a fairer society and nor can we do so today no matter what those that claim to know try to tell us. The idea that we can no longer afford such a vision because we can’t afford it is one of the biggest inventions of our time and one that will continue to impoverish society if we let it. So, in the same way as our parents and grandparents understood the importance of government’s role in investing in better lives for themselves and for their children we must embrace that same understanding and reject the paltry arguments of orthodox economists which has led to increasing poverty and inequality through a casualised labour market, wage suppression and attacks on trade unions all to support global trade, an emphasis on a largely unproductive finance sector and the politics of austerity. There is an alternative to this miserable economic narrative which wants us to believe that governments are financially constrained and all it requires, is for us to challenge those who tell us there isn’t one. Fundamentally a healthy economy is dependent on a healthy and educated population which is not driven by fear of want. The social security system including state pensions, the NHS, public services and transport networks are all necessary to the good working of society and a nation cannot function properly without the vital infrastructure which underpins a strong economy. Whilst this generation cannot burden future generations with higher taxes or debt burden we have to recognise that there are limitations related to consumption of finite resources and that the resulting damage to the environment will diminish the prospects for our children’s children and beyond. This is perhaps the most pressing problem of our times which we must reflect on urgently. Therefore, the onus on this generation and its elected governments is to do two things: firstly to commit to investing in our young people over the long term to ensure that they can be employed in productive well paid jobs to serve the needs of future generations including the retired; and secondly but more importantly we have a responsibility to ensure that we actually have an environmentally sound planet to bequeath to our grandchildren and their children. We should be clear that the current government has made an ideological choice instead to impoverish future generations by cutting spending and all for ideological reasons that have nothing to do with the well-being of society today or in the future. When Labour left office in 2010, Liam Byrne left a very unfortunate message saying there was no money left. The Tories have dined out on this lie ever since. We were compared to Greece and next in line to be affected by a sovereign debt crisis, and in 2010 Osborne claimed that the Tories had taken the country back from the brink of bankruptcy. The Tories have used the household budget narrative of deficit reduction, balanced books and surplus to justify the need for austerity when, in fact, it is not just the wrong recipe to return our economy to health but also a deliberate deception about how our state finances and economy actually work. This deception has allowed the Tories to funnel more and more money into ever fewer hands and make the claim that we cannot afford public services or the NHS. The mantra of ‘there is no money’ has been used to justify the dismantlement of the safety net for when we are at our most vulnerable, and worse still the selling off of every aspect of our publicly provided services to the private sector. This government is making a political choice and people across the country are paying the price for it. So it is easy to understand how we buy into the idea that we have to pay our national debt down and balance our books. However, one cannot, in any way whatsoever, compare our own household budgets with the state money system. Is not like a household. It doesn’t have to balance its budget (even though George Osborne says we do). In fact, reducing the deficit or going into surplus will remove money from the non-government/private sector. Doesn’t tax first then spend later which means it doesn’t have to rely on raising taxes to spend. It doesn’t save its tax revenue – it destroys it. So to be clear taxes are not paying for anything not even your pensions! express public policy by subsidising or penalising certain industries or economic groups – for example railways for the first and polluting industries for the second. Doesn’t spend money like we do – it isn’t the user of the currency. It is an issuer of the currency and creates money as it needs it. Can’t ever run out of money and it definitely can’t go bankrupt. (Unless it is a European government and a member of the Eurozone. In that case a country becomes a user of the Euro and not the issuer. Then it is perfectly possible for it to go bankrupt as it is using what is, in effect, a foreign currency). Can’t borrow its own money through selling bonds or treasuries to fund deficits and doesn’t’ ever have to worry about selling bonds to do so. When such bonds or treasuries are issued it is not about financing government spending it is a mechanism for controlling the interbank lending rate and the money supply. These treasuries/bonds are a bit like our bank accounts where we have a current account and a deposit/savings account where we park spare money we don’t need to get some interest. This is what the private sector does – pension funds for example – stash their money in a risk free place to earn some interest. Some call this corporate welfare and it is completely unnecessary. To follow the logic to its natural conclusion. If a government can issue the money it needs, it doesn’t have to borrow a bean from anyone at all. Indeed, why would it borrow money it had issued in the first place? Can’t save up its own currency for a rainy day. Last year George Osborne announced that he would attempt to bind future governments to maintain a budget surplus when the economy is growing saying ‘we must act now to fix the roof while the sun is shining’. Budget surpluses do not represent ‘public saving’ which can be used to fund future public expenditure or a cache of money that can be spent later. A budget surplus only exists because private income or wealth is reduced so when there is a budget surplus private wealth is destroyed. Can’t live beyond its means. Wait I hear you say won’t the magic money tree lead to inflation like it did in Germany or Zimbawe? Whilst it is the issuer of the currency that doesn’t mean that it can carry on spending ad infinitum as this would be inflationary. The only thing that will restrict government spending is access to resources. So, assuming there are idle physical resources including labour a government can continue to spend without concern for inflationary pressures. Banks, businesses, people or countries may choose to invest their money in bonds as they earn some interest – they are in effect non-risk places to park money. This is our ‘National Debt’. To explain: you have a current account receiving no interest at all. So you put some of the money you don’t need into a deposit account like a Bond for example. The bank debits your current account and credits your new savings account. When it matures the bank debits your bond account and credits your current account with a little bit of interest to boot. You are always in the same financial position plus you get a little bit of interest. Nobody ever says that the bank is ‘in debt’ because you moved money from your current account to your savings account. So saying that the UK government is ‘in debt’ because people, institutions or corporations have exchanged their pounds for government bonds is just as misleading. Government bonds are basically £ equivalents and the government creates them both from thin air. The “National Debt” is not by any measure a debt, but a measure of saved pounds. And since that pile of saved £ never gets any smaller, you can consider those £ to be “retired.” Government bonds, in a net sense, don’t ever get cashed in and spent (although they could). They just sit there, unused, and once in a while a small bit of interest is added to the pile. And that pile has no discernable effect on the economy. 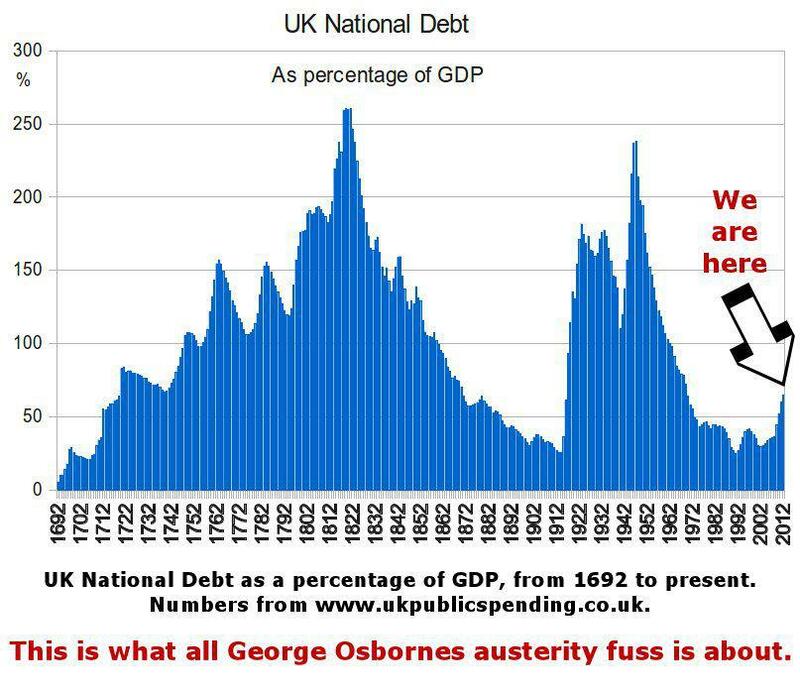 So there you have it – we are not in debt up to our ears – George Osborne and the media just want you to think we are. Finally, on the subject of the burden of debt on future generations. Only today, the Chancellor shamelessly used yet another scare tactic in response to his plans for more public spending cuts by saying “We need to act today now so we don’t pay later”. However, this is not to say that we shouldn’t be concerned about the direction in which the country is travelling in. Reducing the deficit and aiming for surplus simply removes money from the private sector which means that people have to take on debt. There has, over the last few decades, been a huge increase in private debt and the trade deficit (that is the difference between our exports and imports) is at worrying levels. But that’s another story. Note: These articles whilst written for largely for a US and Australian audience you just need to replace $ for £. It’s all the same! 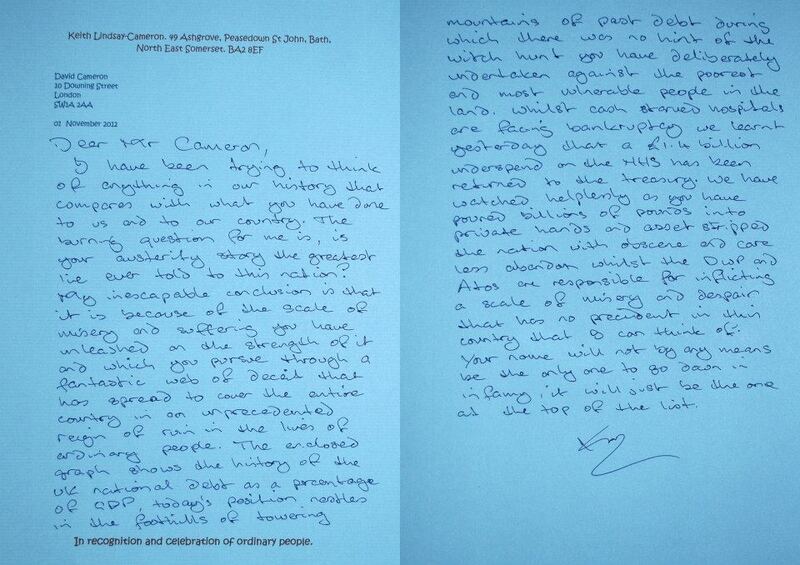 Letter written to David Cameron by Keith Ordinary Guy. Keith’s campaign featured on his blog is a series of letters to David Cameron, and Keith writes a letter every single day. I have been trying to think of anything in our history that compares with what you have done to us and to our country. The burning question for me is, is your austerity story the greatest lie ever told to this nation? My inescapable conclusion is that it is because of the scale of misery and suffering you have unleashed on the strength of it and which you pursue through a fantastic web of deceit that has spread to cover the entire country in an unprecedented reign of ruin in the lives of ordinary people. The enclosed graph shows the history of the UK national debt as a percentage of GDP, today’s position nestles in the foothills of towering mountains of past debt during which there was no hint of the witch hunt you have deliberately undertaken against the poorest and most vulnerable people in the land. Whilst cash starved hospitals are facing bankruptcy we learnt yesterday that a £1.4 billion underspend on the NHS has been returned to the treasury. We have watched helplessly as you have poured billions of pounds into private hands and asset stripped the nation with obscene and care less abandon whilst the DWP and Atos are responsible for inflicting a scale of misery and despair that has no precedent in this country that I can think of. Your name will not by any means be the only one to go down in infamy, it will just be the one at the top of the list.